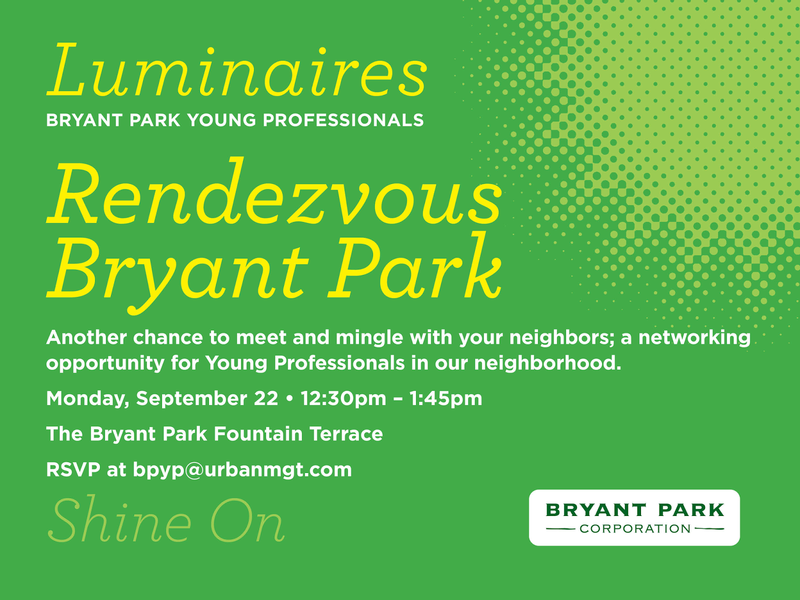 You know by now that our Luminaires Young Professionals Group serves two purposes: creating a point of access for young professionals who want to be more involved at Bryant Park, and providing networking opportunities for those who work near the park. Luminaires will host a lunchtime Speed Meet next Monday, September 22, and achieve both those goals. Bring your business cards to exchange with other Luminaires, and bring your appetite because lunch will be provided. You'll have the pleasant experience of lunch in Bryant Park without having to search near and far for an open table! To join attend the Speed Meet, RSVP at bpyp@urbanmgt.com. Attire for the event is business casual; please be between the ages of 21 and 35.